Yesterday was book launch day or, as I prefer to call it, book birthday for Death in D Minor, the second book in the Gethsemane Brown series. Thank you to my fellow Missdemeanors for hosting a blog party. I was in meetings all day at my, to borrow a phrase, daytime situation so I appreciate their help making the day a success. 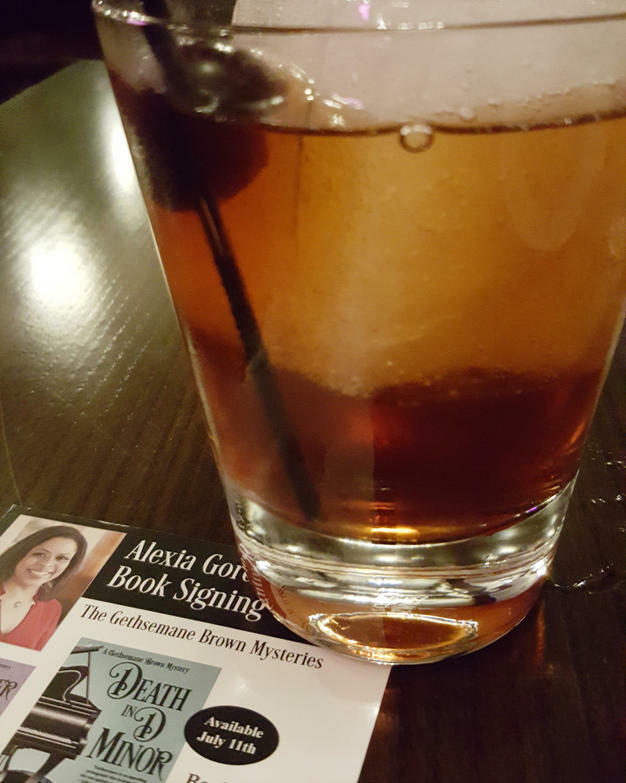 After work, I celebrated my new novel’s release at one of my favorite places, the Deer Path Inn. This historic inn opened in its current location in 1929. Architect William C. Jones of Holabird and Root fashioned it after a Tudor manor house in Chiddingstone, Kent, England so it looks as if it came straight out of an Agatha Christie mystery. When I arrived at the inn, after a hearty “Welcome back” from several staff members (yes, I visit a lot), I headed for the White Hart Pub. I started with a new (to me) cocktail called The Chancellor, a slightly sweet, completely delicious concoction of Balvenie 12yr scotch, 10yr tawny port, and campano vermouth. I followed up with the charcuterie (a French word that, a friend explains, translates to “big ole pile of cured meat”) tray and topped the evening off with coffee and chocolate lava cake with vanilla ice cream. Then I went home and slept until around 1 a.m. when lightning flashed so close it illuminated my bedroom and thunder boomed loudly enough to shake the house. I interpreted these as a celestial fireworks show celebrating my new book instead of harbingers of the power-outing, stoplight-frying, flood-inducing storm that’s created a Chicagoland traffic nightmare this morning. What places do you frequent that transport you into your favorite mystery?